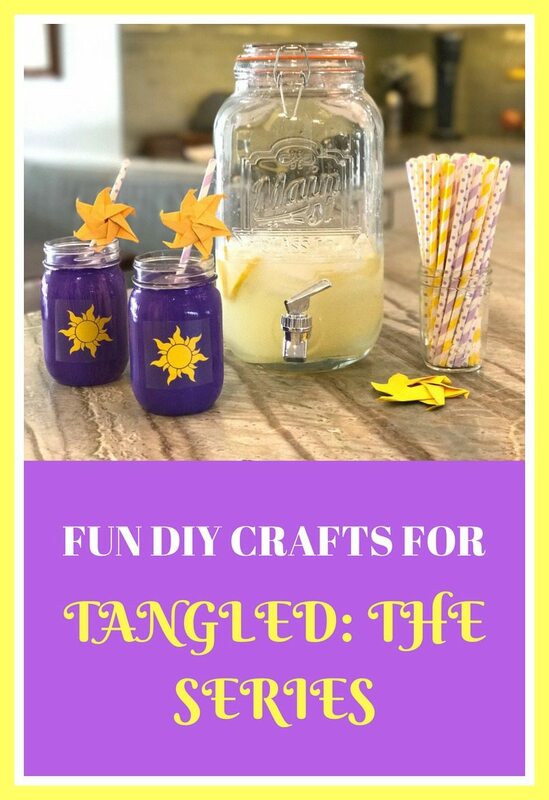 Last month Disney launched Tangled: The Series and in honor of that we have a DIY Craft for you. We’ve been fans of Rapunzel for years, and we’re thrilled there is now a regular series we can watch. For us, the series comes on weekdays just after school is out for the day. We thought it would be fun to create our own Tangled DIY projects while we get ready for the show to start. The weather is finally warming up. 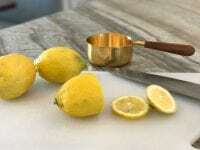 And there’s no better way to beat the heat than with a glass of cold lemonade. This is the inspiration for our new Tangled-inspired star mugs. If your kids are like ours, I’m sure they love to paint too. This is the perfect project for kids of any age since they really can’t mess up. 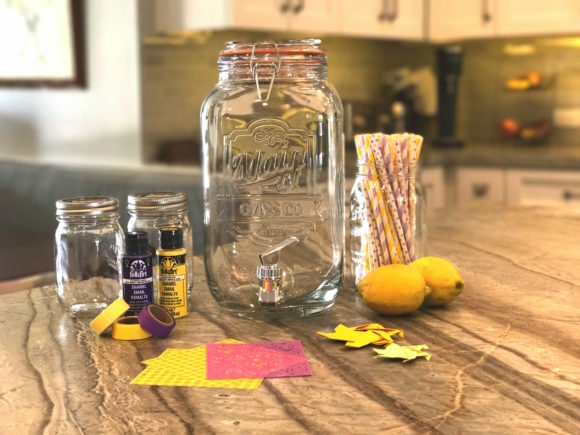 Take a mason jar and paint it in either yellow or purple… or both. 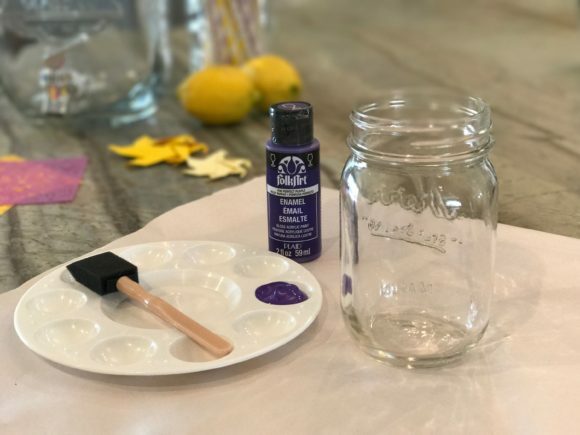 Paint the jar from just under the rim down. This will create a clean look. 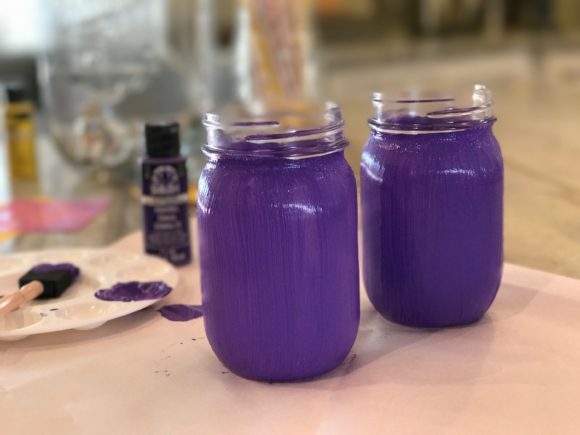 Once your jar is painted, let it dry completely. Also, make sure you’re using an enamel that can be used on glass and won’t wash off over time. Once your glasses are completely dry, add a star stencil. 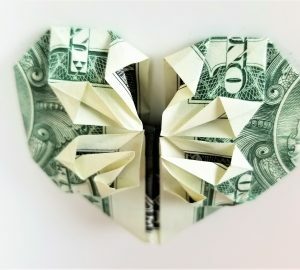 You can use a cookie-cutter, find a cutout online, or order one from Etsy. We ordered ours, because we know we’ll be using it time and time again. 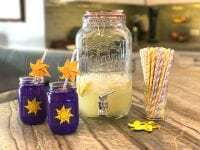 Using a contrasting color, add the star stencil to the center of your glass and paint over it. Carefully remove your stencil. This is where little ones might need a bit of help. We also recommend using a sponge brush for this project. Once dry, your glasses are ready to use. 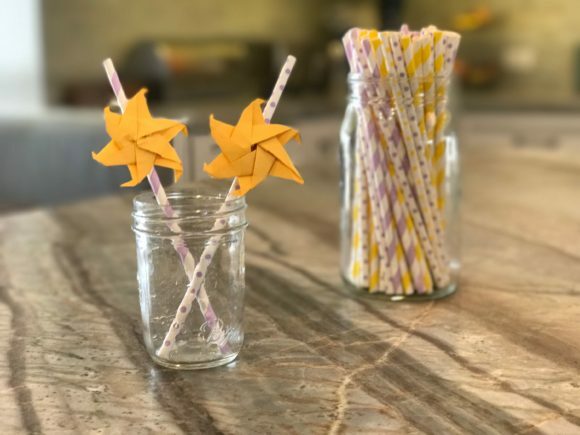 Our very talented Annette Barney, of Origami Foodie, made these adorable origami Tangled sun stars. 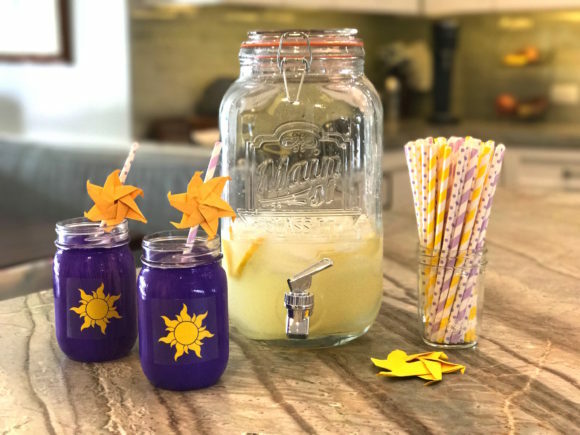 These were a perfect addition to make our very own sun straws for the glass of lemonade. 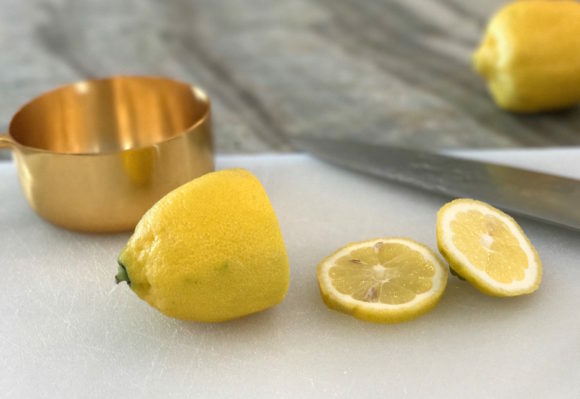 We have a simple lemonade recipe that cuts down on the amount of sugar, but the kids still love to drink it up. It’s honey-based, instead of using granulated sugar. If you can’t use honey, you can also use agave nectar. Heat the honey and 1 cup of water until dissolved. Add to the rest of the water, mix thoroughly. Add the 2 cups of ice and chill until ready to use. If you can't use honey, you can also use agave nectar. 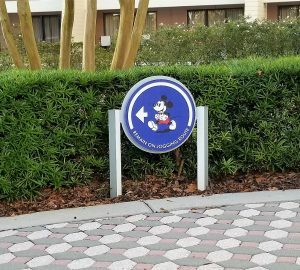 When your kids love their favorite Disney characters, it’s so easy to come up with fun projects to do with them. 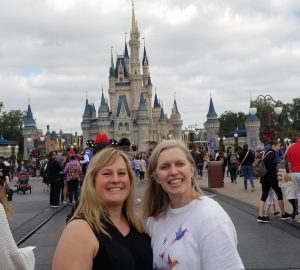 A little Disney goes along way around here. 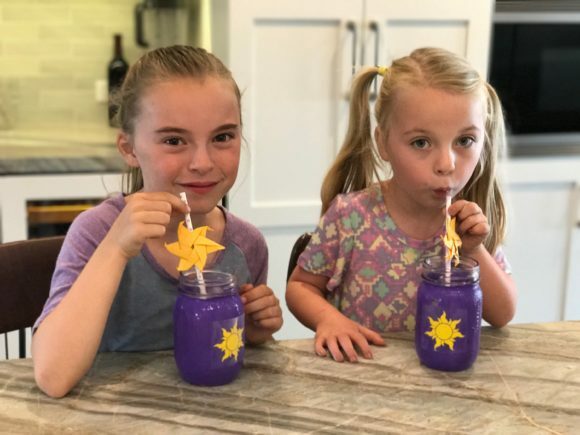 The kids love their new glasses… full of their favorite lemonade. Time to run… Tangled is coming on and we’re ready to watch! Do your kids love the new Disney Tangled: The Series? Here’s a DIY project you’ll want to do with your kids.